New Orleans, Louisiana - otherwise known as NOLA or The Big Easy - has made significant strides since the devastation brought on by Hurricane Katrina in 2005. The city - noted for it rich cultural history, distinct French Creole architecture, music, and cuisine - has seen recovery in the area of tourism, and several major events have returned - or like Mardi Gras, were never displaced to begin with. 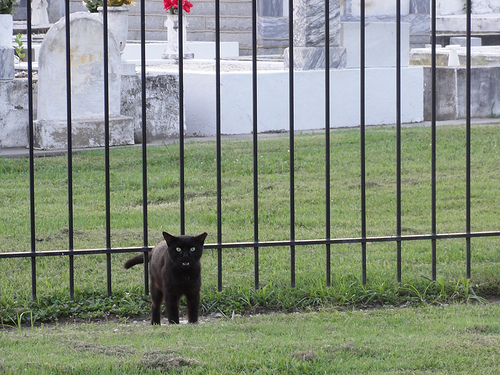 When I visited the city several years ago (pre-Katrina), I had the pleasure of going on a vampire tour, visiting several cemeteries, and exploring Marie Laveau's House of Voodoo. 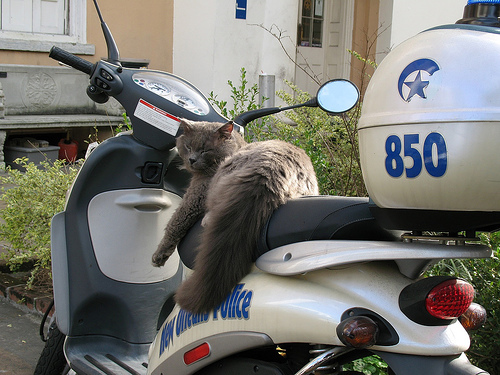 It's no surprise that cats, mysterious creatures that they are, would find themselves right at home in a city steeped in such mysticism. 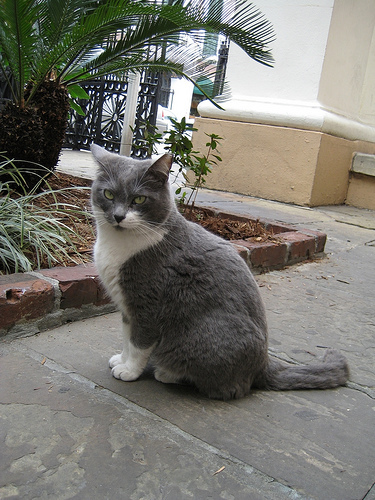 If you stop by Molly's at the Market on Decatur Street, you might catch a glimpse of their resident kitty, Mr. Wu. 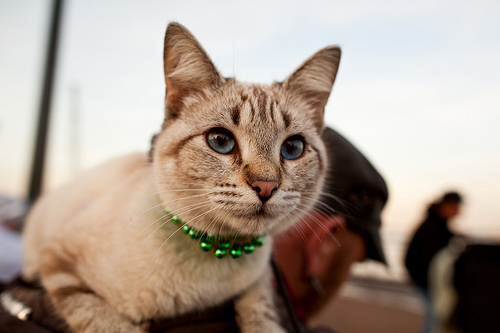 No one quite knows where the cat came from, but he showed up one day after Hurricane Katrina and never left. 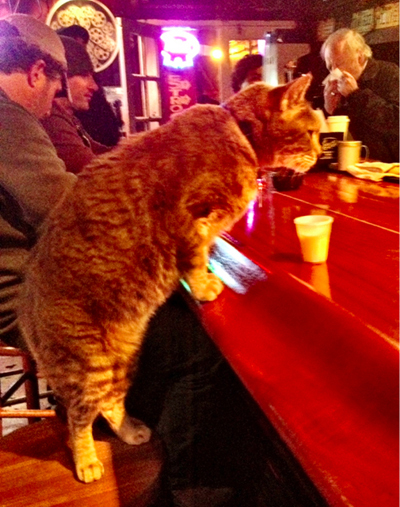 One lucky patron snapped the above pic after observing the amiable kitty plop down on a barstool one night and get served a drink. Said patron also claimed that wasn't even the strangest thing he saw that night. St. Francis Animal Sanctuary (SFAS) is the largest no-kill companion pet sanctuary in the Southeast United States, and a forever home to more than 400 companion pets annually. According to their website, SFAS not only rescues pets, but they also give compassion and hope to struggling families who lost their jobs or homes and are no longer able to provide for their furry loved ones. While the sanctuary itself is located in Tylertown, Miss., in 2009 they opened the St. Francis Thrift and Gift Shop and S&S Consignment in Mandeville, La. All of the profits from the shop go to St. Francis, and there's even a section at the front of the store called "Kitty Heaven" where cats from the sanctuary are allowed to hang out, and have the chance of finding their forever home. In fact, thanks to the visibility they receive, 104 cats have been adopted out of the shop to date! 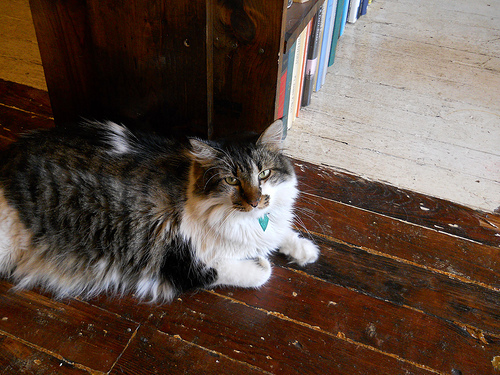 Any used bookstore worth its salt has a resident cat, and I'm willing to bet that NOLA has more than a few. While you're shopping at Crescent City Books on Chartres Street for used, out-of-print, and rare books, as well as antique maps and prints, be sure to say hello to Isabel. The store's gorgeous kitty recently celebrated her 1-year-anniversary of being in residence, and rumor has it she can typically be found napping in a woven basket on the second floor.